NES Final Fantasy (USA) in 1:10:16.18 by TheAxeMan. 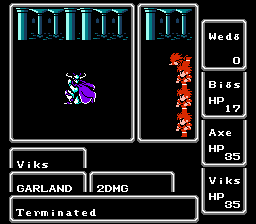 Final Fantasy is one of those games which needs no introduction to most gamers. For the rest of you, the game follows four generic heroes who are trying to restore the four orbs which have been contaminated, and ultimately defeat Chaos. Unfortunately only one of the warriors is actually a hero; the rest are sissies who died early on during the quests. Strange as this may sound, much time is saved by doing so since fewer commands need to be entered every time the player runs from a random encounter. This version is almost 3 minutes faster than the previous movie, predominantly by the use of a computer program to assist in battle planning and by walking in no-encounter areas more often.